Moneyball more closely resembles The Social Network than baseball epics like Field of Dreams. 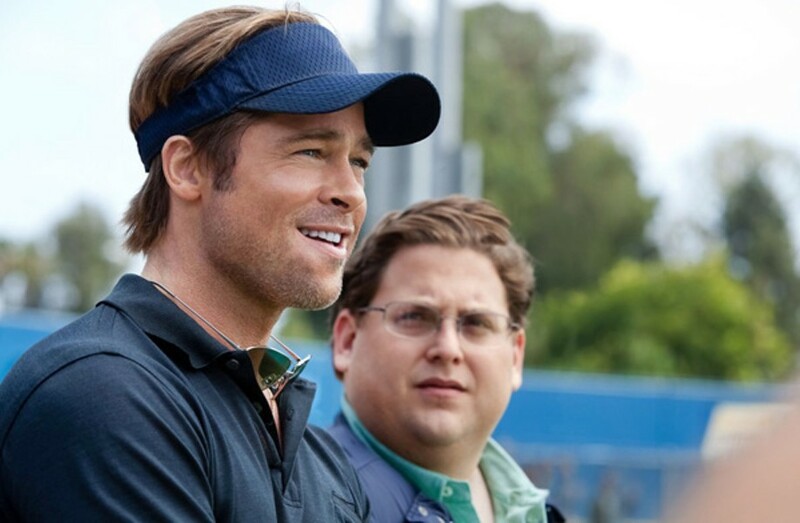 For Oakland Athletics fans, it's advisable to look at Bennett Miller's Moneyball without thinking of the actual baseball team. This year the subject is almost too depressing. Better to consider the drama of Billy Beane and the 2002 A's as a film of the book rather than as a touchstone for the guys currently stuck in third place in the weakest division of the American League. We'd much rather relive their most recent glory days, which is where this thoughtful, atypical sports movie takes place. Michael Lewis' bestselling 2003 book was more than just the most intelligent baseball book of the past twenty years. It sent a booming wake-up call through the baseball world with its humorous, insightful account of how A's general manager Beane — engagingly played in the movie by Brad Pitt — compensated for his team's limited budget by inventing a whole new way of thinking about ballplayers, by seeing the value that no one else sees. Miller's movie follows suit. The early action takes place mostly in the front office and the locker room rather than on the field; it saves the game heroics, such as they are, for the second half. For that, director Miller (Capote) relies heavily on MLB game footage. The real story is in Beane's relationship with his manager, Art Howe (Philip Seymour Hoffman); the players, especially reclamation case Scott Hatteberg (Chris Pratt) and retread David Justice (Stephen Bishop); and Beane's assistant and disciple, a composite character named Peter Brand (Jonah Hill, modeled on Paul DePodesta). There's plenty for sports fans to savor in the tale of how the A's used their miniscule resources to get to the playoffs in 2002 after losing three key players to free agency. The transformation of Hatteberg from a washed-up catcher to a serviceable "pickin' machine" first baseman. The Streak, in which the A's won an American-League-record twenty games in a row with a tantalizing victory. The constant chafing of Beane's radical new approach (inspired by Bill James and his Baseball Abstract) against old-timers like Howe and Grady Fuson, playing himself as the team's head scout. But the central concept of the movie and the book is a revolution in thinking, and this Moneyball more closely resembles The Social Network (that film's Aaron Sorkin wrote the screenplay with Steven Zaillian and Stan Chervin) than it does can-of-corn horsehide epics like Field of Dreams or The Natural. Billy Beane was, and still is, the Athletics' only true natural, a one-time phenom who washed out in the majors and applied his life lessons to a controversial sports and business model that roused disbelievers — we hear the voice of skeptic Joe Morgan — as well as adherents like Boston Red Sox owner John Henry (Arliss Howard). Pitt completely inhabits the role of Beane. Hoffman doesn't really look like an ex-second baseman, he looks like Truman Capote. It's a thrill to hear Bill King's sterling broadcast voice coming from the big screen. Moneyball sells the sizzle, not the meat. Let's go Oakland! Update: A previous version of this story misstated the name of sabermetrics pioneer Bill James.